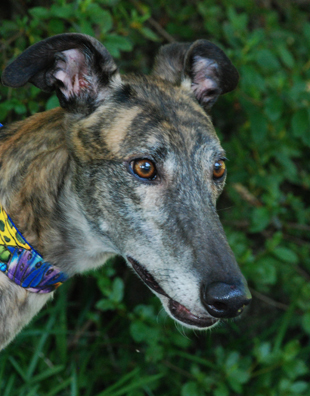 Tamale is a beautiful brindle girl that raced at 64lbs. Her birthday is May 22nd 2004 and her sire is DK's Prime Time. 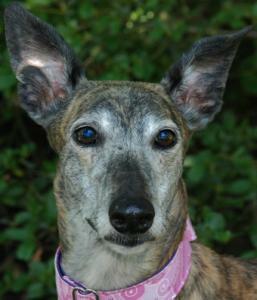 Tamale is home acclimated and has lived with another female greyhound (Tessie), children and cats in her previous home. She is living with a small white fluffy dog in her current foster home and is fine with him as well. She is exceptionally well behaved and has a calm, sweet, loving personality and seems wise beyond her years. She did not have a fenced yard in her previous home so is used to going potty on leash so would be OK without a fenced yard. Tamale was returned with Tessie for financial reasons. She has been living with Tessie who is also available for adoption if you look at their other pictures you will see a picture of the two girls sleeping together in their foster home. They would love to find a home together. Tamale is already spayed but just had a fresh dental and a health check from our vet and is ready for adoption. Tamale is such a sweet, loving girl! 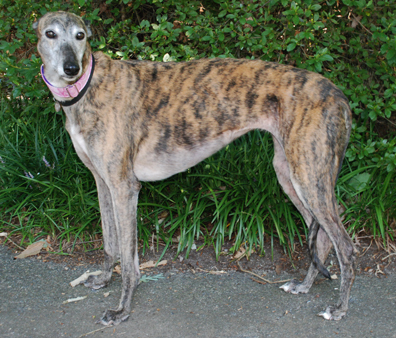 Tessie is a pretty brindle, 5 year old girl that is a daughter of the famous Kiowa Sweet Trey. We have placed many of his pups and they are exceptionally sweet. Tessie raced at 67lbs and just turned 5 on April 23rd. 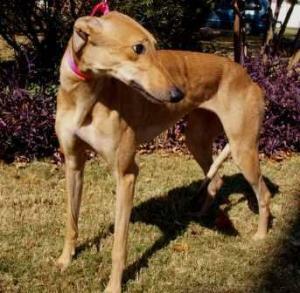 She is a happy, playful, friendly girl that would be an excellent meet and greet dog. She goes up to everyone asking for love. 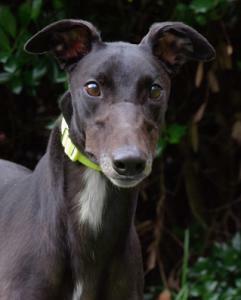 She has lived in a home with another female greyhound (Tamale), cats and a toddler so should be fine in a home with any of those things. Her foster home has a small white fluffy dog that she is also fine with. Tessie did not have a fenced yard in her former home and is used to going outside on leash to potty so should do fine in a home without a fenced yard. She did enjoy going to the neighbor's fence yard to run around occasionally and does still love to run a few laps now and then. Tessie was returned with her housemate Tamale due to financial reasons. Both girls have settled into their foster home and are perfectly behaved and wonderful sweet girls. If you look in their other pictures you will see a photo of the two girls snuggled up together in their foster home. They are very bonded and we are hoping to find a home that can take them together. Tessie is home acclimated and just had a fresh dental and a checkup from our vet. She has already been spayed. Kiss is a small red female that weighed 53 lbs at the vets. She ran 34 races but broke her leg in her last race. 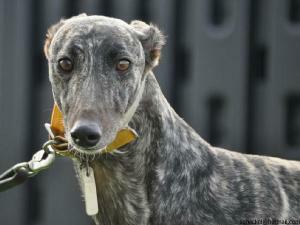 Her trainers had her leg fixed and splinted and kept her at the track until it was healed. She is out of her splint now and the leg has healed so she is ready for retirement. She only limps sometimes now so we expect her to make a complete recovery and the old break shouldn't effect her ability to run and play or go for walks. It was a minor break that didn't even require any surgery. Kiss is 2.5 years old and her birthday is July 5th. Her sire is Jimbo Acorn and her dam is Jimbo Storm. She is is a waggy girl that gives kisses. Her trainers said she was a good girl at the track that was easy going, calm and well behaved. She is doing great in her foster home with the older children that live there. She definitely likes the kids and gets along well with the other dogs there. She even shares a dog bed with the older male greyhound. She has such pretty soulful eyes! Because she crates quietly and potties well on leash we think she would do great living in an apartment or townhouse. Nothing fierce about Sasha Fierce. She is a sweet girl that gives kisses to everyone she meets. 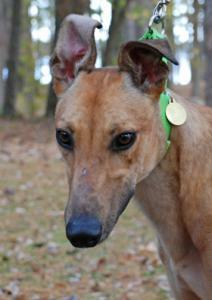 Sasha is a beautiful, light fawn girl that raced at 60lbs. This cute floppy earred girl just celebrated her 2nd birthday on Oct 9th. She only has 9 races listed. Her sire is the famous Dodgem By Design and her dam is JT Hyper Jax. 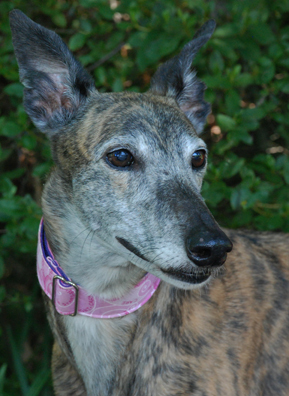 Sasha passed her cat test at the track and should be OK to live with cats or small dogs. Sasha is very outgoing and friendly and doesn't seem to be bothered by anything. She made the transition from the track to home life very easily and doesn't seem stressed at all. She is in a foster home with several small children and a baby and loves the children. She is curious about everything and is learning that things in the trash and the children's toys don't belong to her and shouldn't be stolen. She is starting to learn "No" and "leave it" after just a few days. Her foster home has yet to hear her make a sound. She crates and never complains even if she initially doesn't really want to go in. Sasha has an awesome personality and is the type of dog that is going to be comfortable in just about any situation. She has the cutest huge eyes and those cute floppy puppy ears! 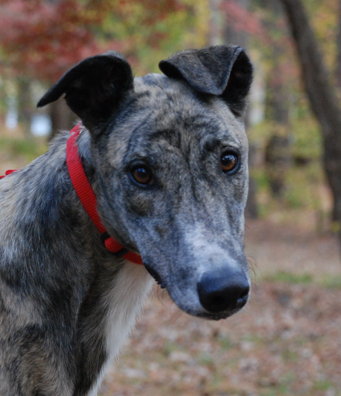 Winston was adopted by his former owner as a puppy and never was registered or raced. He was returned to us in very poor condition, much too thin and has pressure sores and other problems as a result of living outdoors in bad conditions for a long time. He needs a dental but our vet says he is too weak for that right now so he is on hold for a few weeks until he is strong enough to have that done. Winston is expected to make a full recovery but walks like a very old dog now because muscle loss from of being kept in a tiny pen and from poor nutrition and not enough food. He will be a beautiful black guy eventually when he recovers. Winston was so happy to finally have a soft bed to lay on and didn't want to get up off the bed. He didn't make one peep all night in the crate at his foster home and was just happy to be sleeping inside. We are pretty sure Winston is a littermate to a puppy one of our members owns because of his age and where he initially came from. We don't have any information on who his parents are though because he was never registered. Winston is home acclimated and seems to have good house manners so was a house dog at one time. He will let you know when he needs to go outside by going to the door and whining and has had no accidents in the house. He is very calm and loves to lay on dog beds and travels very well in a car. 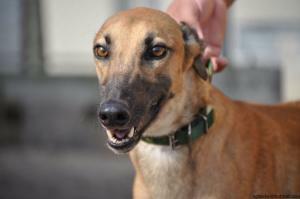 He has done well with the small dog in his foster home and the other two male greyhounds. Week 1 update: As Winston gains his strength back and has started to put on much needed weight, he has started feeling well enough to get up off his dog bed and greet guests that come to the house. He only feels good enough to give few wags and doesn't bounce yet. He only stands for a minute or two and has to go back and lay down. He can walk without wobbling now and even trots and goes up and down stairs. Winston is starting to show interest in toys and the other dogs when they play although he isn't actually playing yet. Sometimes he does do a play bow. We expect him to make a full recovery. Week 2 update: Winston is starting to feel up to playing with toys and other dogs. He still wears out quickly but can do a very slow lope now in the yard and is stable on his feet and no longer moves like an old dog. He is gaining weight and gaining muscle tone although he is still very thin. His pressure sores are slowly getting better. He is strong enough now to take for his cat test and he actually seemed a little afraid of the cat and had no interest in chasing it whatsoever. Week 3 update. Winston is much stronger now and is playing in short bursts. His pressure sores are healed except for the largest one. His muscle tone is gettng better and he only has a few backbones sticking up and a few ribs showing instead of all of them. His hipbones aren't as prominent. He still has about 10lbs to gain but he looks a lot better. Winston is scheduled for his dental this week if he passes his vet checkup. Update: Winston passed his vet checkup and was able to have his dental. He has recovered fully and although he still has horrible scars from his ordeal, he has a great happy attitude. 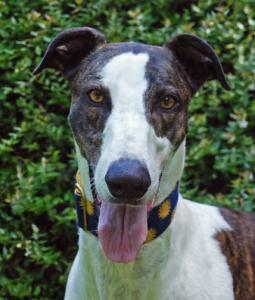 He is in a very loving home that attends greyhound events and he performs at the Carolina Renaissance Festival as one of the hounds of East Fairhaven. He is a friendly happy guy that finally has the home he deserves. We found out that Winston's birthday is 12/15/05 and he was adopted on his actually birthday. Ellie May is a beautiful girl that just turned 9 on June 10th. She has been checked out by our vet and is healthy. Ellie May is very sweet and gets along well with everyone and is very well behaved.Â Ellie May has lived for years in an adoptive home as an only dog and has great house manners. Her adoptive mom has been forced to give her up because of severe health problems that prevent her from caring for a dog. Her adoptive mom was hoping she would be able to recover and keep Ellie May but after having her boarded for 6 months made the difficult decision to let her be rehomed. Ellie May only has one behavior problem,Â she doesn't like to be bothered by other dogs when she is eating and sometimes growls at them to get them to back off. Our foster home simply feeds her in her crate and that prevents all problems. With any dog that shows even minor possessive behaviors like this (even though it is normally with other dogs and not people) we won't place the dog in a home with smaller children. That is the only reason that she has that restriction, she does like children and has been good with the ones she has met. She is living with small and large dogs in foster care and is fine with them. She loves to play and tries to get the other dogs to run and play with her. She doesn't act like an older gal at all and seems to be the life of any party. She has figured out the doggy doors in her foster home so is a bright girl and proves that older dogs can learn new tricks. 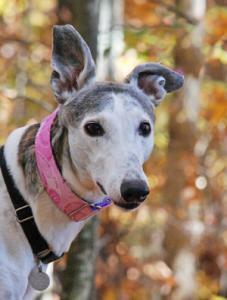 Ellie May is a very sweet, happy girl that is very friendly and loving. She loves dog beds and seemed to settle in easily and didn't even skip a meal. This is a great girl that would be happy as an only dog or one of several. She passed her cat test so could live in a home with cats. Her sire is DC's Wooster and her dam is Greys Gold Coast. Because she is a senior Ellie May qualifies for a reduced adoption fee of $200. 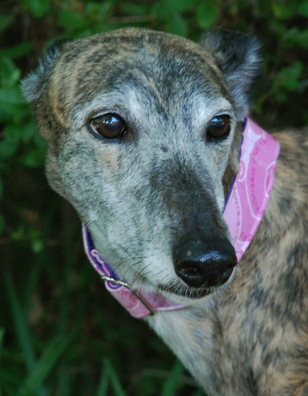 Another contribution has been made toward her adoption fee thanks to the generosity of CrazyCollars.com. Feather raced at 68lbs so is a smaller male. 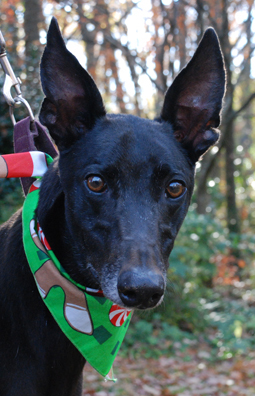 He is a black male with a gorgeous shiny coat and a tiny white spot on his chest. He passed his cat test at the track so should be able to live with cats or small dogs. He is even living with guinea pigs in his foster home. 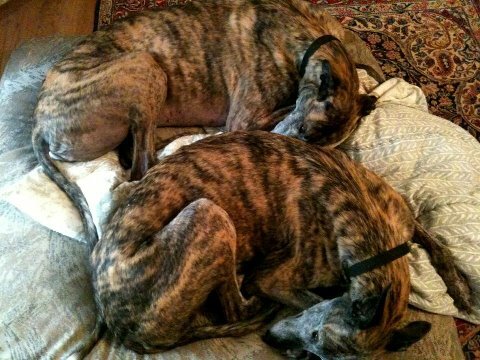 He gets along well with the male greyhound he his living with too. Feather is also living with a baby in his foster home so should be good with children. His sire is Yahoo Omar and his Dam is Flying Exorcist. Feather is 3 years old and his birthday is July 19th. Feather was very good on the dog haul and just got in the van and laid down. A very good traveler. He was very polite with the other dogs and seemed to be a very nice guy. He LOVES people and loves to give people he meets kisses. He even gives hugs sometimes. He is a happy very outgoing guy. He potties on leash nicely so may be OK for a home without a fenced yard. Such a sweet guy and so well behaved in his foster home. 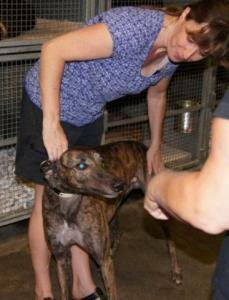 Trusty is a good sized brindle male that raced at 74lbs and is now about 78. He is 3 years old and his birthday is May 30th. His sire is the famous Dodgem By Design and his dam is Caymanacadillac. Trusty passed his cat test and has been good around smaller dog so should be OK to live with either. 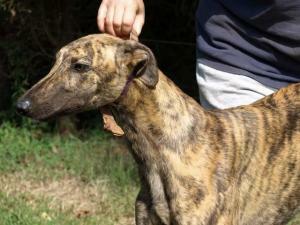 He is a gorgeous brindle guy with a lot of white on his chest and white feet. Very striking! He is very friendly and very loving and loves all people he meets. Not a bit of shyness in Trusty. He is bouncy and goofy and loves to play with toys. Seems like an easy going guy that adapts quickly because he was playing with toys and being silly his first day in a home. When he tripped over a stack of magazines, instead of being worried or frightened he grabbed one and started playing with it. Trusty would be a great guy for a family that wanted a dog that was comfortable in new situations such as traveling, hiking or maybe even dog sports. Holly is a smaller fawn female that raced at 56lbs. She just retired from the Sanford Orlando Track. Holly's sire is Tonys Oracle and her dam is WMS Sprint Away. She is a littermate to several dogs we have already placed Anderson Cooper, Red Bull Now and Snowflake Henry and is also a littemate to Black Espresso that is also available for adoption. Her birthday is August 10th and she is 2 years old. Holly is a friendly girl and did great at her first meet and greet with everyone she met. Freddy just arrived. He is a littermate to Angel and Breezy two very sweet girls that we placed. 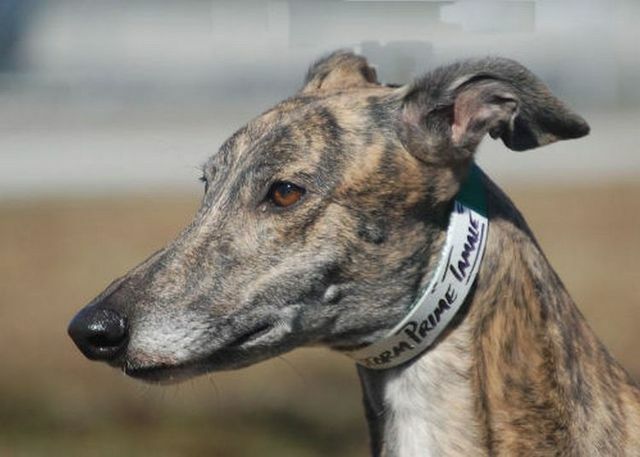 Freddy just retired from the Orange Park track in Jacksonville, Fl where he raced at 73lbs. His birthday is April 4th and he is two and a half years old. Freddy's sire is Beyond the Chill and his dam is Hd's Cherry. He traveled well on the trip up from the track and seemed to be a very well behaved boy. So far he has done well with the smaller dog and children in his foster home. 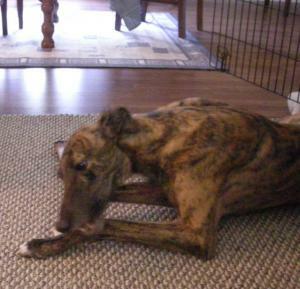 He is a gorgeous red brindle with golden eyes that follows his foster mom around leaning in to snuggle and for petting. He is very outgoing and seems to love everyone. He crates well and is quiet in his crate all night. He did great at his first meet and greet and seemed to really enjoy all the attention. Sweet sweet boy!! Pretty just arrived from the Jacksonville race track. We have been waiting on her to retire because one of our volunteers owns both her mother AND her grandmother. We definitely wanted to see the third generation. Her sire is CJ Pepto Geno. Pretty's birthday is February 1st and she is 3 years old. She raced at 65lbs. More as we get to know her. Bingo Man has lived in a home for several years and was returned to us for financial reasons. He lived with children and small dogs in his former home and is great with them. He also passed his cat test so should be fine living with them. Bingo man was born on March 22 2005 so he is 7 years old. He is a sweet, outgoing guy that is well behaved and already home acclimated. He good manners and doesn't jump but is happy to see you and very loving. What a gorgeous guy he is with the dark tips on his fawn fur. He is a very large guy that raced at 80lbs and is a little heavier than that now. In his other pictures we have some older photos of him when he first retired a few years ago. Such a stunning guy!! 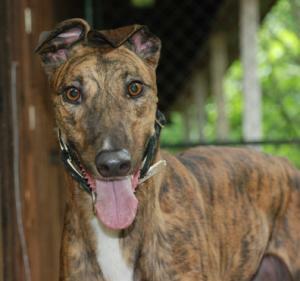 Colby is a very large fawn brindle male that raced at 84lbs. He is lighter tan with black stripes. 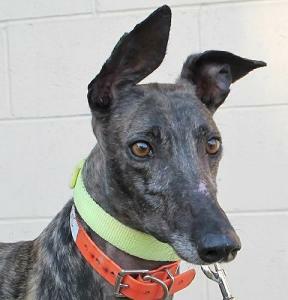 He has a big head and a short nose for a greyhound which makes him very striking and unique. Colby passed his cat test at the track so should be OK to live with cats or small dogs. His sire is Kiowa Mon Manny so that makes him a half brother to quite a few dogs we have placed. His dam is Pat C I'm Trying. Colby is 2.5 years old and his birthday is May 6th. Colby traveled well and seems like a great guy. He crated quietly all night his first night after one reminder. He was a little overwhelmed by everything the first night in his foster home but quickly came around and was bouncing happily in his crate when he saw his foster mom in the morning. He seems like a gentle giant that is calm and easy going. He did great with a small dog in his foster home. He also pottied very nicely on leash so might do OK in a home without a fenced yard. 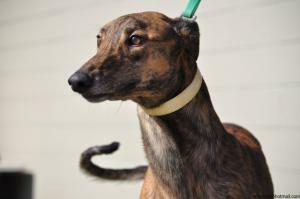 Espresso is a smaller black male that just retired from the Sanford Orlando track, where he raced at 67lbs. He travelled well on the trip and seems like a well behaved guy. He passed his cat test at the track too. He was born on August 10th. Espresso's sire is Tony's Oracle and his Dam is WMS Sprint Away. He is a littermate to some of the dogs we have already placed including Anderson Cooper, Red Bull Now and Snowflake Henry. Holly My Girl is also a littermate that is available now. Espresso did great at his first meet and greet and was good with everyone he met. 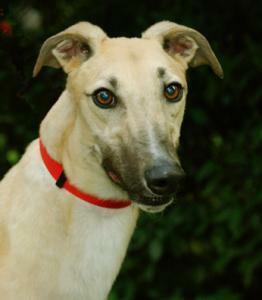 George is a beautiful fawn boy with a white face that is a smaller guy, racing at 67lbs. He just retired from the track in Orlando. He is a littermate to one of the very sweet dogs we already placed named Betta Recognize. His sire is the famous Dodgem By Design and his dam is Sky Robber. George was a successful racer that raced most of his 89 races at the A level. He will turn 4 on August 1st. He is one of his trainers favorite dogs and he was pretty spoiled at the track. He passed his cat test at the track and does great with the cat in his foster home. He is friendly, waggy and SO loving! He thinks it is impossible to get enough petting. He loves having people around and complains when left alone in his crate so he would probably not be a good apartment or townhouse dog. He does potty well on leash so may not required a fenced yard if someone was willing to walk him several times a day. He has done great with the other dogs and grandchildren in his foster home. 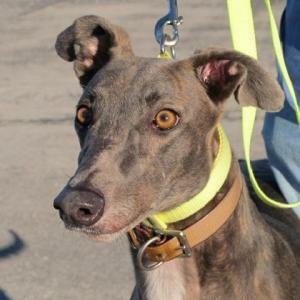 This is a sweet gorgeous boy and we can see why he was one of his trainers favorites. 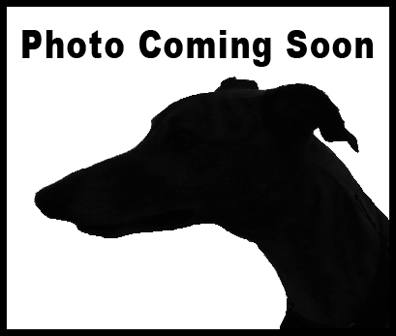 Peterbilt is a gigantic, dark brindle male that raced at 88lbs. He came from the Daytona race track and had a very short racing career. He never actually won a race and was retired after 8 races. He is a very friendly, happy guy that still needs cat and small dog testing. Peterbilt seems pretty calm for a guy that isn't even 2 yet. He will turn two on November 7th. His sire is Kiowa Wish Frank and his dam is Pasampsi. He is a happy guy that doesn't seem to be too worried about anything. He just laid down on the haul up from Florida. When another dog growled at him he curled up smaller and turned his head to avoid bumping anyone so he seems like he is just a gentle giant. Gladiator just retired from the Orlando track. 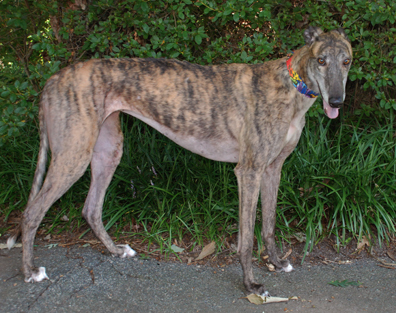 He is a gorgeous, red brindle male with white toes, chest and white tail tip that raced at 75lbs. He just turned 4 on July 14th. Gladiator was a good racer that raced in 100 races. He actually competed in a couple of stakes races and raced at 7 tracks. He is a happy, friendly guy but is a calm, well behaved guy too. Gladiator's sire is the famous Craigie Whistler. He passed his cat and small dog tests at the track but did show a little interest at first in the outdoor cats at his foster home so we listed him as trainable with cats. He has done great on his potty training in his foster home and responds very well to the word "No" the rare times that he needs to be corrected. He did great with a house full of visiting children last week and seems to like kids. He likes to play with toys by throwing them up a few times. Then he is ready for another nap. He loves to lay outside in the sun. Gladiator seems like he might be a good watch dog because he will sometimes alert you when he sees his own reflection in a window at night. He is pretty sure that other dog is up to no good. He is normally quiet in his crate and crates willingly. He is a very good boy and seems to have adjusted to life in a home with no problem at all. He is a great guy! Mac has been retired for about a couple of months due to a badly broken leg. He had to have surgery on it and had to have a temporary metal rod attached to the outside of the leg to hold it in place while the bone heals. He will be a resident at our vets office until the temporary metal rod is removed which will be late October. He won't be able to be adopted until late October or early Nov when the vet clears him to go home. Mac will never have full use of his leg but it will still be useful for balance. He will probably always walk with a limp but will probably be able to run very well just using his 3 good legs. Mac is a super sweet friendly guy that loves everyone he meets. He has been a wonderful patient and loves all the attention he gets from the vet staff. If you are interested in meeting him he can have visitors at the vet. A family interested in adopting Mac could put him pending until he is cleared for actual adoption. 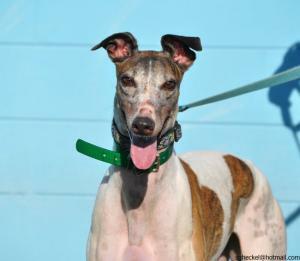 Mac is a joint effort between our group and Greyhound Pets of America Electric City who took him in initially and funded most of his very expensive surgery. 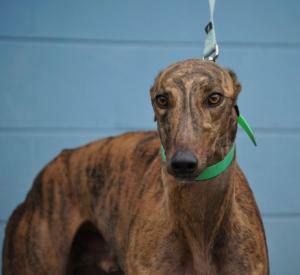 We thank many generous donors including his racing owner and trainer, the Jacksonville Race Track Adoption Kennel and even fans at the track that saw the injury happen that have also helped cover his surgery and months of vet care. Everyone has pulled together to help this very special guy. Mac's sire is the famous Lonesome Cry and his dam is BF Oxbow Ruby. He just celebrated his 3rd birthday on August 22nd. 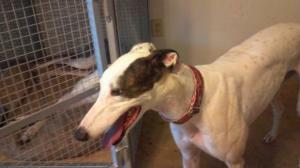 Al is a bouncy happy silly guy that just retired from Derby Lane because of an injury to a leg. 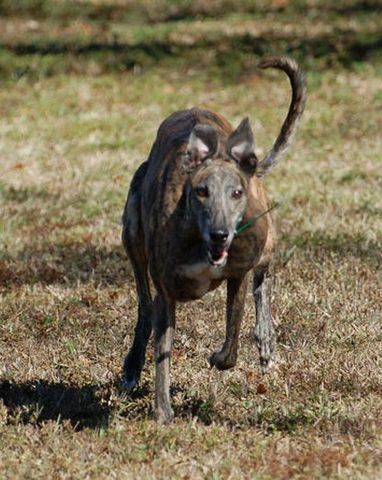 He is a beautiful brindle that raced at 76lbs. He just turned 3 years old October 3rd. His sire is the famous Kiowa Sweet Trey and his dam is Dreamy Blossom. More as we get to know him. Jake is a red male that raced at 75lbs. His sire is TK Quick Strike and his dam is Samantha Sam. He just turned two on October 27th. 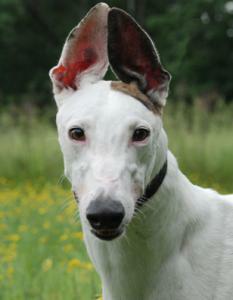 Jake passed his cat test at the track so should be OK living in a home with cats or small dogs. Jake is very outgoing and loves people. He will roll over and wave his legs in the air to get your attention and to get belly rubs. He is very silly and happy and not phased by much. He is pretty good on leash and does potty on leash so may be OK In a home without a fenced yard. A family camed to meet him the day after he arrived and fell in love with him and adopted him on the spot. He will go home with them as soon as he is vetted. Diva just retired from the Orlando Race Track. She is a daughter of the famous Flying Hydrogen so is related to a bunch of our dogs. Her dam is Gable Maldives. She raced at 62lbs and her birthday is February 7th. She travelled well on the trip and just laid down. She passed her cat test at the track. More as we get to know her. 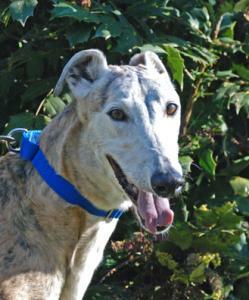 Alan is an eight year old boy that is very sweet, calm and well behaved. 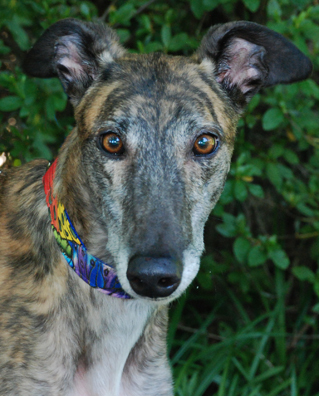 He is a light brindle with beautiful golden eyes. Alan has so much white in his fur already that he looks like a blue brindle. He has lived in a home for years and was returned with his housemate Fargo because his owner's severe health problems made it impossible for him to care for the dogs anymore. He lived with quite a few other dogs in the home of several different breeds and was good with all of them. He is good with small dogs and passed his cat test so should be fine living with either. Alan and Fargo are in separate foster homes and seem to be doing fine being separated so we will adopt them out separately unless someone wants both of them. 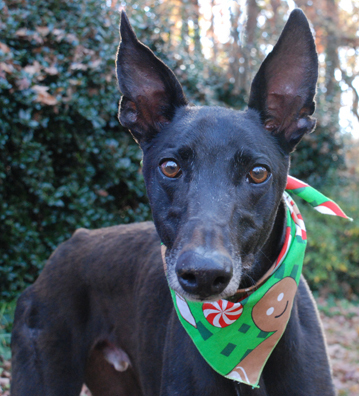 Alan is a perfect gentleman and just wants snuggle up and lean on you. He would probably make an awesome therapy dog because of his gentle, calm, friendly nature and because he loves children. Because he has lived in a home for years, Alan is not used to being crated and can be a little vocal about it. He is well behaved out of the crate however so may not need one. Alan is an extra large male and weighed in at the vets at 92lbs and is not fat. Don't let his size worry you though. He is very good on leash and very easy to handle. He is so laid back and really a gentle giant of a guy. He did great at his first meet and greet going up to everyone for love, especially the children. This sweet guy will really steal your heart. Alan has a clean bill of health from our vet and is ready to go home. He just had a fresh dental and got all his shots. 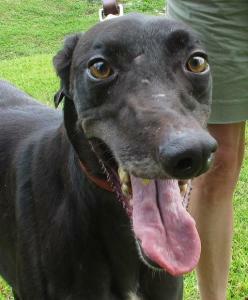 Lucas just arrived from the Jacksonville Race Track and is a very friendly boy. He made sure he greeted and got love from everyone of the vet's staff when he arrived. This guy loves people, especially the ladies! He is a littermate to one of the dogs we recently adopted out named Speedo. His sire is Deerfield Site and his dam is Steffie's Charm. 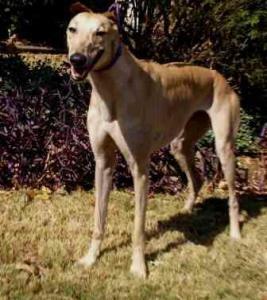 Lucas celebrates his birthday on May 22nd and is 4 years old.Â He raced at 69lbs so is a smaller male weight wise but is pretty tall and lanky. 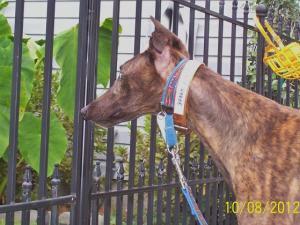 This is a sweet handsome guy with the most beautiful dark orange brindle coat. Just stunning. He had a tail injury so had to have his tail amputated but his short waggy tail stub suits him. He is one of those very waggy greyhounds that can't seem to keep their tail because they whack it on everything. He still had his tail in his photo and you can see it is wagging like crazy. Lucas foster family has fallen in love with him and he is pending to them. 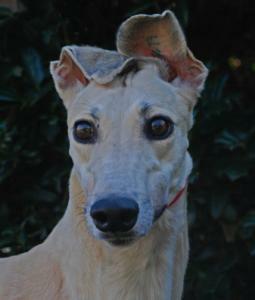 Country Comfort is a small, outgoing fawn boy with half a tail. He is a Tony's Oracle pup a bunch of others we have placed that have been awesome pets. His birthdate is 9/24/2009 so he just turned 3. He is a small male that raced at 67lbs in Orlando. He is more tan and brownish than orange or red. A very pretty color. He travels very well. A very nice boy that seems happy and friendly and hasn't met a stranger. His racing trainer said that he is a smart guy and learned how to lift the gate latch and let himself and other dogs back into the kennel from the turnout pen. He did it several times before they fixed it so he couldn't. He did it at the vet's office after we got him too. 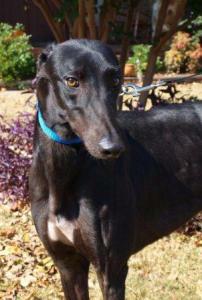 Country is a very calm laid back boy that has been a wonderful foster. He isn't a marker and potty trained easily. He can be a little vocal in his crate when left alone so wouldn't be the best dog for apartment or townhouse living. He crates OK when no one is home but if he hears people he will make noise to get let out of the crate. He does growl at dogs that come close when he is eating but so far that has not been directed at humans. We automatically mark dogs "no small kids" if they show any protective behaviors at all even if not directed at people. He should be cat trainable but was interested a little at first according to his cat test at the track. He did loose interest in them after he met them. Country has been fostered with very small dogs and has been fine with them so should do well in a home with them. Red Bull just arrived from Orlando. He is a small red male racing at just 66lbs. 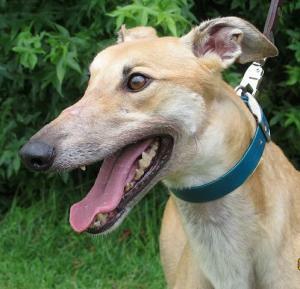 He is a friendly, happy and waggy but calm and well behaved. He is a littermate to a couple of dogs we placed Snowflake Henry and Anderson Cooper! Half brother to Cute Candle, My Favorite, Jojo Girl, Nancy G Gracie, Fabulous Fox, Raine Henry and New York Aster. His birthday is 8/10/10 so he is 2 years old. He is being fostered in Augusta and is settling in well to his foster home with kids and small dogs. He follows the child in the house around and seems to really like kids. He eats well and potties well on leash so may be OK without a fenced yard if he was leash walked to potty. He crates well and is quiet in the crate so may be a good choice for an apartment or townhouse living. Brooker raced years ago in Orlando. His sire is Craigie Booker and his dam is Windy Wendy. Brooker is a small gorgeous boy. He has been in a home for years and was surrendered to us because he had some grumpiness over his space that concerned his owners that were new parents. They didn't think he would be good with a toddler. He has been in foster care and so far we have not seen any grumpiness over space whatsoever even though we have bothered him when laying down and sleeping. Because of his owners saying he had some space issues in the past we put him down as needing a home with no small kids. He has been nothing but calm, sweet and well behaved since he arrived though. Brooker is very friendly and waggy so much so that he injured his tail while wagging and had to have it removed. He is a leaner that will put his head in your lap for love and just stand there as long as you are willing to pet him. Brooker is very cat friendly showing no interest in them even when they are running around outside. He crates well and seems to be a great guy that is already home acclimated. He crates well and quietly so might be a good choice for a townhome or apartment. He loves to play with toys and is a very young 7. 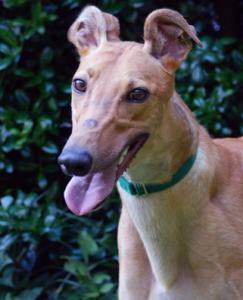 With his great looks and sweet personality we think he will find a home quickly. 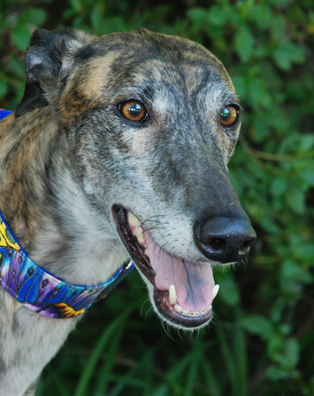 Hurricane is beautiful, friendly, blue brindle male. He is anything but a hurricane and is actually a calm well behaved guy that is gorgeous. He is a mid sized guy that raced at 75lbs and just retired from the Orlando Race Track. His DOB is 7/4/09 so he is 3 years old. More as we get to know him. 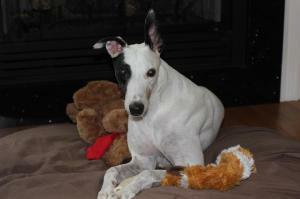 Jason never raced and has lived in a home as a pet his entire life. He is an extra large male that weighed 89lbs at the vet. He is calm and well behaved even though he is only 2 years old and seems to have good house manners. Jason is a confident guy and has adjusted quickly to foster care. He doesn't seem to be bothered by much. He crates well and is quiet in his crate. So far he has not tried to play with the other dogs in his foster home (all males). His former owner said he did best with her dominant females. He did play too rough with the younger dogs and could get bossy with them but the more dominant females set him straight and he was very respectful of them. He might do best in a home with dominant females and seems like he would also be fine as an only dog. Jason is VERY loving and sweet with adults and absolutely LOVES attention. He will follow you around and likes to be with people. Very very sweet and calm for such a young guy. He hasn't been around many kids and so far and isn't too sure about them and tends to avoid them. He is pretty good on leash most of the time but because he is young still gets a little excited in new situations and needs reminders not to pull. Jason is a drop dead gorgeous guy that has the most beautiful shiny coat! We got Jason because he played too rough and was bossy with a few of the dogs in his former home. He lived with small dogs in his previous home and is doing fine with a small white dog in his foster home now. Because he is still young, big and plays rough, he probably wouldn't be a good choice for a home with a very tiny dog unless it was a female that would make it very clear that she didn't want to play with him. Fats is a special boy that was born with an abnormally short nose that is a bit crooked...well OK maybe a lot crooked. He thinks those things make him extra special and a true "one of a kind", and he is right. 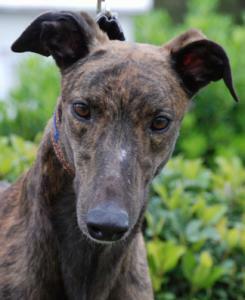 He is actually very cute with his unusual tiny little greyhound nose and definitely stands out in a crowd. Fats is a really sweet guy that loves everyone he meets and will just snuggle up for petting as long as you will pet him. He is very calm and well behaved. He does the cutest little snuffle and snort when he gets excited because of his nose. He travels well and on the trip up from the track just laid down and made himself comfortable. He even rolled over on his back and slept with his feet sticking up in the air in the van. Fats has some serious personality going on and is a very sweet, funny guy. He passed his cat test at the track too! So far he seems like he is a pretty laid back, low energy guy. He loves to play with toys and will play bow and act silly to get you to play with him. He is very gentle and his play sessions only last for a short time though. His sire is EM's Mac Attack and his Dam is Flirtnabout. His birthday is March 7th. Fats got sent to quite a few tracks in hopes he would find a place that he could be competitive. His crooked nose seems to affect his breathing a bit and he just wasn't able to be competitive and only was able to win one race in his career. Fats is fine running and playing with other dogs but tended to overheat at the track when he really ran hard in competition. This is such a sweet, easy, well behaved boy that seems to adjust well and fit right into just about any situation. 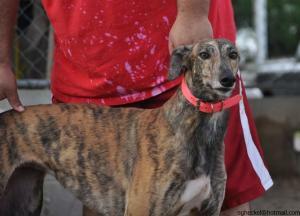 Country Gift is a friendly girl that followed her trainers around the kennel while they were doing their chores. She is a very people oriented girl and very sweet. 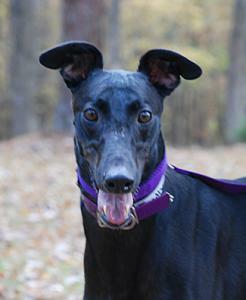 GIft seems like the type that will enjoy running around the yard and playing with toys - a fun girl. She has enough energy for an occasional jog or hike with her family. 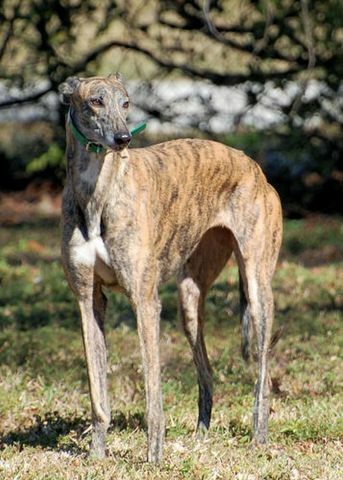 Gift has a beautiful rich red brindle coat with white feet and tip of tail that really makes her a showy stunning girl. She was very interested in chasing the cat during her cat test at the track kennel so has too much prey drive to live in a home with cats. We will do further testing with small dogs to see how she does with them. She needs a little work on walking on leash because she pulls some but seems better already with just a little instruction. A fast learner. Gift raced at 67lbs and will be 4 August 25. Update from her foster home! Gift has been wonderful since moving into retirement. She has wonderful dog body language and moved into her foster pack with no problems at all, quickly and quietly accepting the greetings from the home dogs. She potties perfectly on leash and has already learned to be much more polite while being walked. She has been accident--free inside, crates easily, eats and takes her surgery antibiotics without complaint, and has been a wonderful houseguest. Gift would make a really wonderful choice as a first greyhound as well as acclimating quickly into an existing pack. We have no way to test her in the home with small dogs, but her responses during the vet stay didn't show any prey drive toward them (We do know she isn't cat safe). 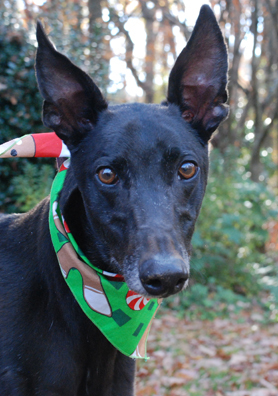 Gift is a truly beautiful dog with a sweet temperament that's ready to go home! Gift has complained a bit when left alone so probably wouldn't be the best dog for apartment or townhouse living. Clyde just arrived from the Flagler race track in Florida. He is a son of a famous sire that was owned by one of our volunteers named Teamster. His dam is Fashionably Late. Clyde's birthday is April 9th and he is 3 years old. 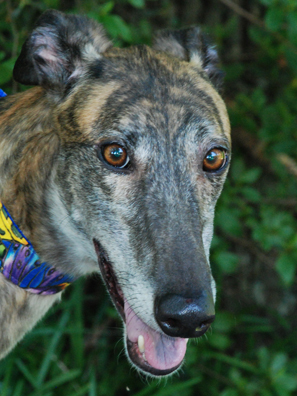 He raced at 72lbs so is an average sized male greyhound. He retired due to a minor sprain so will need a couple of weeks of leash walking to heal up. He has gotten along well with the other greyhounds and a boxer in his foster home and did very well with the kids he met at a meet and greet. He crates well and corrects easily if he does anything wrong. Seems like a great guy! More as we get to know him. Bear is a very large boy that raced at 80lbs. He just celebrated his 3rd birthday on May 24th. He is nearly all white with 3 small brindle spots on his side, tail and one ear. Bear loves everyone and gives kisses. He has an awesome, happy, friendly personality and is very goofy and silly. He follows his family around and can always be found close by if not laying at your feet. Not much bothers him and he loves everyone. Although he loves playing with kids and being around them most of the time, he has shown that he really doesn't like kids in his face or bothering him when he is laying down. Because of that we think Bear will do best in a home without small kids. He seems like he has a little too much prey drive toward cats to be able to live with them and did not pass his cat test at the track. He has been fine with a small, white dog that lived in one of his foster homes though so he seems like will be good in a home with small dogs. Bear corrects easily and all you have to do is tell him not to do something once or twice and he stops for good. This is a stunning guy with such a great personality! Mike is a friendly, playful, happy boy that couldn't be any sweeter. He raced at 69lbs so is a smaller guy. Mike just turned 4 on May 30th. His sire is Daddy Warbark and his dam is Hip Hop Attack. 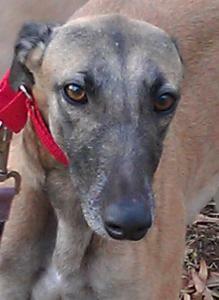 He passed his cat test at the track and is living with a cat in his foster home so should be good in a home with cats. He has been good with kids he has been around too. Mike did great at a meet and greet with a band playing right next to him so he seems to be a dog that goes with the flow and doesn't worry about loud noises. He is a loving guy that loves people and attention. Cherry is really a lover. 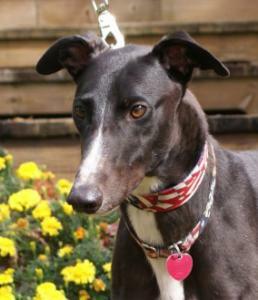 She is waggy and happy and just loves everyone she meets. A very friendly, outgoing girl that raced at 60lbs. Her birthday is Otober 25th. Her sire is Be My Bubba and her dam is Momoni Chris. 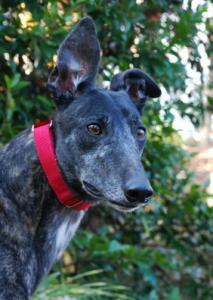 Cherry tested trainable with cats at the track and is doing great with the small dogs in her foster home. She traveled well on the trip up from Florida. Cherry takes food from your hand and loves to lay her head in your lap. She emptied the doggy toy box looking for the right toy the first day in her new home so seems to be very comfortable in new environments and she isn't bothered by much. Blade is a sweet, well behaved boy that is pretty calm. His birthday is December 20th and he is a littermate to another one of our available dogs Duchy and has been living with her in an adoptive home. Unfortunately his mom's schedule changed and she is suddenly having to travel for work so can't keep the dogs. Blade was good with the cats and a small dog in his former foster home. He seems to like kids and chose to go up to children at a PetSmart meet and greet. He is a friendly sweet little guy. His sire is Swahili Eile and his dam is To Shy to Say. We got Blade very young and he didn't have much of a race career but did go through some training to race. Duchess (aka Duchy) is very, very cat tolerant and is good with small dogs too. 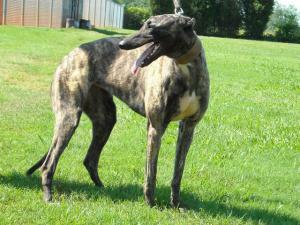 She is a dark brindle with a wonderful dark face and her birthday is December 20th. She had a broken leg as a young pup so never raced. We got her directly from the farm she grew up on as a young dog. She has been living with her littermate Blade in a home for a couple of years now and is already home acclimated and well behaved. Their owner is suddenly having to travel weekly for work and was forced to give up the dogs because of all the time she has to spend away from them. 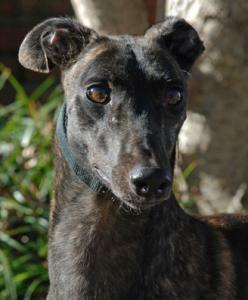 Fabulous Fox raced in Orlando and is a handsome, small, black male that raced at a just 69lbs. His sire is Tony's Oracle and his dam is Campbell Brown. Fox is a littermate to Jojo Girl and My Favorite which we also placed. His birthday is October 1st. His trainers said Fox was a quiet, calm and friendly. Fox would follow them around while they were doing chores and would choose to be with people over other dogs. He was good with other dogs too though. He is good with the small dogs he has been around and passed his most recent cat test. Fox crates well and loves to play with toys. He has the cutest puppyish face and the most beautiful shiny black coat. He is really stunning. Fox is the whole package, gorgeous good looks and a great easy going personality to match. His foster home just raved about what a good boy he is. 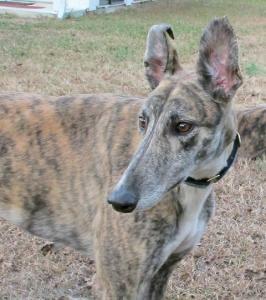 He would be great for the first time greyhound adopter or would be a good addition to a home with several dogs already.